Most of you who have taken part in my streams know I have one particular game that is pretty much my rival. A game in which I have managed to log upwards of 70+ hours of gameplay yet still cannot defeat the Boss at the end of the 2nd level. This is basically the Dark Souls of Match-3 games. The game is a little gem known as Ironcast. At first glance it’s an intriguing little Match-3 game. There are 4 colored tiles that you need to match up as you would in most games from this genre. 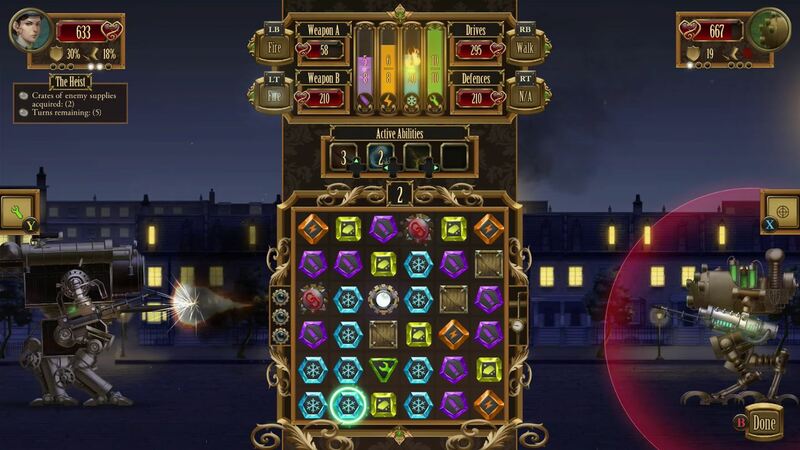 However that is where the similarities between Ironcast and a typical Match-3 game end. Ironcast takes this mechanic and turns it into something very fascinating. Each of these tiles called Nodes, that you collect actually represent something specific. You have Purple for Ammunition, Orange for Energy, Blue for Coolant and Green for Repair. These Nodes are your resources for carrying out your mission. As it slowly unfolds before you the story is one of war. Your soldier and their Ironcast are our last hope to survive. Something has been unleashed. I’d rather not spoil the story, as watching it unfold is another incredible part of this game. 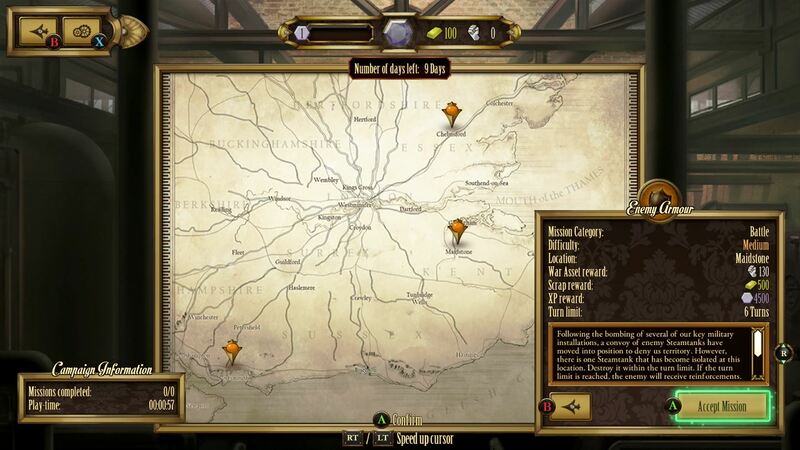 Each round allows for the player to pick between three different battle locations that are somewhat randomly generated to help progress the storyline. There are 3 basic mission types. Battle is exactly as it sounds it’s you versus another Ironcast in a battle to the death. Collection adds a fifth node to collect that is a crate which typically represents cargo or even manpower that will aid in your long war. A typical Collection mission will have you collect around 10 of these crates. The last of the common missions is Survival. In Survival you’re merely tasked with surviving so many turns to win the mission. These are my least favorite and tend to be the most boring and least rewarding anecdotally speaking. Occasionally you may get tossed an odd trade mission where you must pick and choose your dialogue carefully in order to succeed. These Trades are randomized so the same answers will not always work. As you complete your missions, you earn experience, gold and item blueprints which can be used to upgrade your own Ironcast. Spend wisely as not all upgrades are enough of an upgrade to be worthwhile. Likewise as you level up you will be allowed to select additional perks for your Ironcast like abilities or augmentations for either your weapons or your defensive systems. Your Ironcast is fitted with 2 weapon systems. Drives are for evasion and shields for armor. As you learn the in’s and out’s of the game you will learn how to tailor your Ironcast to your gameplay style. With equal parts rogue-like/rogue-lite, Match-3 and RPG, this creates an entirely unique and engaging experience that I feel a majority of the gaming public has missed out on. Ironcast is available on Steam, Xbox One and the PlayStation 4. Missed it Monday is a unique segment designed to allow writers from TheHiddenLevels.com to share a retrospective look at their favorite games from the past. These games are past favorites from no particular console or time. Simply put these are games we think you may have missed or that we personally miss and want to share our memories of. Missed it Monday can be followed on social media using #MiM and is published weekly.